A perfect way to start a Saturday morning. 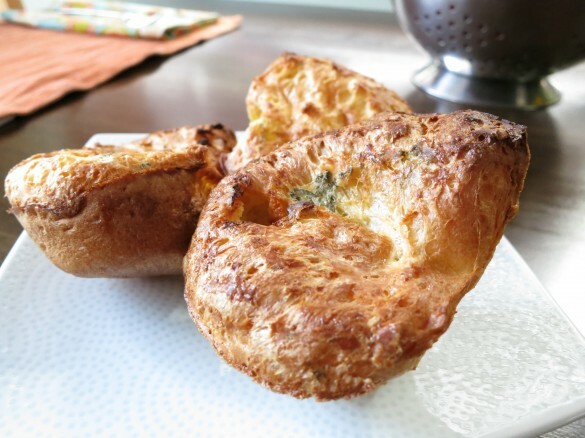 Sage and Chevre cheese popovers ideas. One of the things I love most about writing this blog, is becoming friends with people all over the world; hearing their stories, sharing recipes, being buoyed by their adventures, and trading kitchen tips and tricks. I am humbled by people’s honesty, in their triumphs and in tragedy, and I so appreciate knowing that there are other neurotic foodie folks out there who think there is nothing odd about making six dozen carrot muffins to perfect the technique. One of my favorite exchanges was the discussion of all of our “Scary Foods“. I began with grilled artichokes, but from there came confessions of trepidation about spatchcooking a chicken, feelings of inadequacy with yeast dough, and a personal favorite, “anything animal related”. Popovers have always been on the Intimidating List for me. Done right they are culinary beauties, golden brown with steam escaping from their crusty tops in front of your eyes. Done wrong they are dense little hockey pucks that would be better suited for home protection than mandatory consumption. The trick is that you must not, absolutely can’t, definitely don’t open the oven while they are cooking. For certain people who shall remain nameless (me) this is an exercise is incredible self-control, and let me tell you, it ain’t easy. But if you follow the rules and wait until they are done you will be greeted with a splendid treat and the unexpected, but most welcome addition to just about any meal be it a fried egg, salad, beef tenderloin, or fall lasagna. Makes 12, halves beautifully. Adapted from Joy of Cooking. Move rack to center of oven and preheat to 450 degrees. Grease muffin tins. Popover tins are great too, but the former will absolutely do the trick. In a bowl combine the flour and salt. In a second bowl thoroughly combine the eggs, milk, and butter. Pour the egg mixture over the flour mixture and fold just to combine. A few lumps will remain. Divide half the mixture into the muffin tins, about one-third full. Evenly distribute the goat cheese and sage, and top with remaining mixture. Bake for 15 minutes at 450 degrees, then reduce temperature to 350 degrees and bake for 20 more minutes. Do not open the oven! After the full 35 minutes of baking time, check to ensure they are done. They should be well browned and crusty, or else they will deflate. Remove from pan, and puncture one hole in the side of each to let steam escape. Serve immediately or keep crispy in the oven (turned off) for up to 30 minutes. oh I ADORE popovers! Can’t wait to try it! And I adore you…how convenient! Thanks so much! What’s the most number of times you’ve tried a recipe to get it right for your blog? oh, what a start to the day!! There is nothing like a good popover right from the oven! These sound really wonderful! Thanks Alyssa…these are definitely like a little treasure trove that one discovers…who on earth knew cooking could be so much fun?! Mmm these look so good! 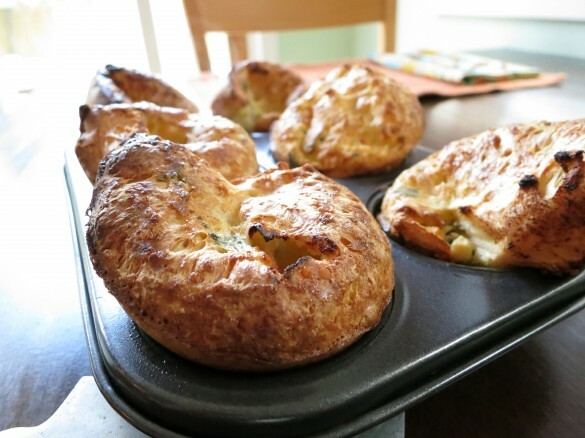 Popovers have such a nice, rustic ring to it too. A rustic ring…I love it! All yeast breads…yup, that would definitely be on my list too! Oh my GOD, I LOVE popovers! Yours are gorgeous (love the chèvre/goat cheese variation). I often have a pan that’s half-popped, half-flat, which I think had something to do with using a 12-cup muffin tin. I can’t wait to give these a try using your method. Let me know how they turn out! I did a half batch and did all 6 muffin tins of a 6-tray and it worked beautifully! Awwww I love what you said about blogging – and for me, it’s baking ANYTHING that is frightening. What beautiful popovers! My mom made them a lot when I was growing up but I’ve never attempted them. Great inspiration, Erina! Hannah! I’m shocked! Being the savvy chef and baker that you are I have no doubt yours will be a wild success. I’m eager to hear how they turn out!